Rebecca Webb Lukens was the first woman to own a mill business. Died: December 10, 1854 in Fallowfield, Pennsylvania. Rebecca Webb Pennock was born on January 6, 1794. Her mother was Martha Webb Pennock. Her father was Isaac Pennock. Rebecca’s family owned land and a nice house. Her father had built an iron works. It was called the Federal Slitting Mill. It made strips of iron. These were used to make wagon wheels and barrel hoops. Rebecca’s father was a Quaker. He believed that girls should have an education. Her father taught her to read and write. He taught her to work with numbers. He taught her to ride a horse. Rebecca had a happy childhood. She wandered around the countryside and played with her cousins. When Rebecca was 12 she went to boarding school. She loved school. At the age of 16 she came home. Her family was large. Rebecca had six younger brothers and sisters. Her mother needed her help. Rebecca took care of her baby brother. In her spare time she read books. Later Mr. Pennock let Rebecca go back to school. She studied French and chemistry. Rebecca’s father started a new business. He started it with a partner. The partner was named Jesse Kersey. The men bought an old sawmill. They turned it into an iron mill. They named it the Brandywine Iron Works and Nail Factory. Rebecca came home from school. In 1812 she went to Philadelphia with her father. There she met Dr. Charles Lukens. Charles and Rebecca liked each other very much. They saw each other many times. They were married on March 23, 1813. Rebecca and Charles moved to a house near the Federal Slitting Mill. For two years Charles worked at the Brandywine Iron Works. Rebecca had a baby, named Martha, in 1814. After two years, Charles thought about making a change. He wanted to move back to Abington. He could be a doctor again. Rebecca’s father persuaded him to stay. He bought Jesse Kersey’s interest in the mill. Now it all belonged to Isaac. He leased the business to Charles for $420.00 per year. Charles and Rebecca moved to a farmhouse near the mill. The farmhouse was in bad condition. The mill needed to be improved. Rebecca started to work on the house. Charles worked on the mill. Rebecca and Charles had three more children. Elizabeth was born in 1817. Charles Edmund was born in 1819. Isaac was born in 1821. Isaac only lived 10 months. He died in March 1822. Rebecca’s father Isaac Pennock died in 1824. Rebecca’s mother tried to take over the mill. She did not care that Charles and Rebecca had worked so hard. Rebecca was sad that her mother was so unkind. That same year Charles Edward died. Then, in 1825, her husband Charles died suddenly. He was 39 years old. Rebecca was 31. Rebecca had three little daughters. Soon Rebecca had a baby girl. She named her Charlesanna. She was named for her father. Now Rebecca had to make some hard choices. She needed to care for her family. Charles had asked Rebecca to keep the mill going. She decided to run the mill herself. Rebecca was a good businesswoman. She made contracts for work. She took care of selling what the factory produced. She bought supplies and materials. She had help from Charles Lukens’s brother. His name was Solomon. Solomon Lukens managed the mill. Steam locomotives started running in the United States. Rebecca saw a chance for business. The Brandywine Iron Works started making iron plates for locomotives. The quality of the plate was very good. Some factories in England bought their plate. The factory did well. In 9 years Rebecca paid off the money that the factory owed. She also paid her mother for her part of the business. Rebecca had four daughters left. In 1832 her daughter Elizabeth died. She was 15 years old. Rebecca was very sad. She put her energy into the mill. She made many improvements. She rebuilt a lot of the mill. She built homes for the workmen. She built a store and a warehouse. She made a freight stop at the Coatesville railway station. This meant that they could send their products to Philadelphia and Pittsburgh. Some of the plates were even sold to a company in New Orleans. They built riverboats to go on the Mississippi River. In 1837 a depression started. It was called the Panic of 1837. Things were bad for six years. Many businesses had to close. Rebecca would not let her workers go. She closed the mill. Her workers repaired machines. They built walls. They worked on the farm. Sometimes there was no money to pay them. Rebecca paid them with dairy items, vegetables and meat. Soon there was another problem. A tariff is a charge put by the government on certain services or goods. In the 1840’s, the government started charging tariffs on manufactured goods that were delivered by train. Rebecca fought these tariffs. She said they were not fair to her business. Rebecca’s three daughters all married. 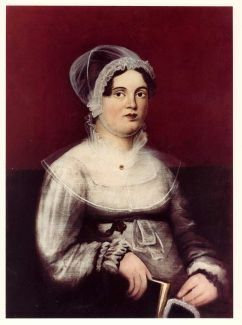 Martha married Abraham Gibbons. Isabella married Dr. Charles Huston. Both men joined the family business. Now Rebecca did not have to work quite as hard. Rebecca’s youngest daughter Charlesanna married Dr. William Tingley. The next year she died when her baby was born. Rebecca took baby Annie to her home, and cared of her. Rebecca died on December 10, 1854. Rebecca’s family changed the name of the mill to Lukens Mill in 1890. They did it to honor Rebecca. Today the company is called Lukens Steel. There is a carving on the front of the Chester County Courthouse. It shows nine people who helped to develop Chester County. One of them is Rebecca Lukens. Reading Level 5.5. Picture of Rebecca Webb Lukens courtesy of the Stewart Huston Charitable Trust.